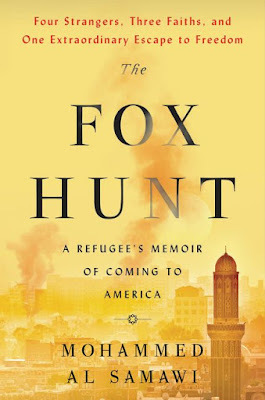 Brooklyn Digest: Books: "The Fox Hunt: A Refugee's Memoir Of Coming To America"
This is quite a change from how he grew up in Yemen as a young, devout Muslim, and was taught to hate and fear Jews and Christians. As he grew up, he eventually pushed back against the boundaries of his culture and began to question some of its proscribed teachings, discovering fundamental similarities between religions and peoples. Al Samawi's mission to foster interfaith understanding put him in grave danger when civil war erupted in Yemen. Facing certain death, he reached out to a far-flung network of likeminded but virtual strangers over social media to save his life. The Fox Hunt is Al Samawi's riveting account of the drama in his country, a singular story of international friendship and human decency set against a backdrop of war, violence, ignorance, and hatred. Al Samawi was born into a prominent, middle class family in the Old City of Sana'a in northern Yemen. His parents were both doctors, and his young life was privileged, if tempered by physical disabilities he sustained as he suffered a small stroke as a baby. Young Al Samawi focused on his studies and always asked questions to satiate the keen curiosity he had about the world around him. That curiosity led him to university, where his vision of the world changed drastically when a much-admired British teacher gave him a Bible to study. He was stunned to discover the similarities between the holy books and everything he previously had believed was called into question. This led Mohammed to a determination to learn more about other faiths, and he turned to social media. After he connected with Jewish people through Facebook, he looked into work with humanitarian NGOs. Soon after, he was traveling to interfaith conferences outside of Yemen, meeting some of his virtual friends in person, and holding a hope for the future. Eventually, Mohammed's groundbreaking worked marked him as the enemy in insular Yemen, and he started to receive frequent death threats. When war erupted in his home, he feared that being there would put his family in danger, so he fled to Aden, the large coastal city in the south. That was not the salvation he was looking for, as Aden was actually worse, with fighting being waged in the streets and the Saudis started to launch airstrikes. When electricity became available, he reached out to friends on social media for help. What transpired after his outreach was miraculous in that four regular people around the world forged chain of connections that scoured an informal network of contacts, including aid workers, government officials, ex-military, and even United States Senators, to get him out of Yemen. Al Samawi's grueling ordeal lasted thirteen days, and the story is at once heartwarming and heart-stopping. This story read like a motion picture, and it is in development with Fox 2000 Pictures. Marc Platt Productions, known for "La La Land" and "Bridge of Spies," is producing, while Josh Singer, the Oscar-winning screenwriter of "Spotlight," is adapting the book for the big screen. Mohammed is the Global Ambassador for Interfaith Youth and Leadership for The African Middle Eastern Leadership Project (AMEL), a Washington, DC-based nonprofit that empowers Millennial activists from the Middle East and Africa to build more inclusive societies, and advocates for people in Washington with that goal in mind. Al Samawi also serves on the board of the Yemen Peace Project, which is an advocate for peaceful United States policy towards Yemen, especially when it comes to the US government's current role in the ongoing civil war. To help advance these efforts, Mohammed tells his own story of personal transformation with religious groups and academic institutions around the country. Here in New York, he is on the board of the Muslim Jewish Solidarity Committee, a nonprofit focusing on grassroots social action to build relationships between Jews and Muslims. The Fox Hunt is an inspirational story of compassion, faith, friendship, and redemption, and well worth reading.